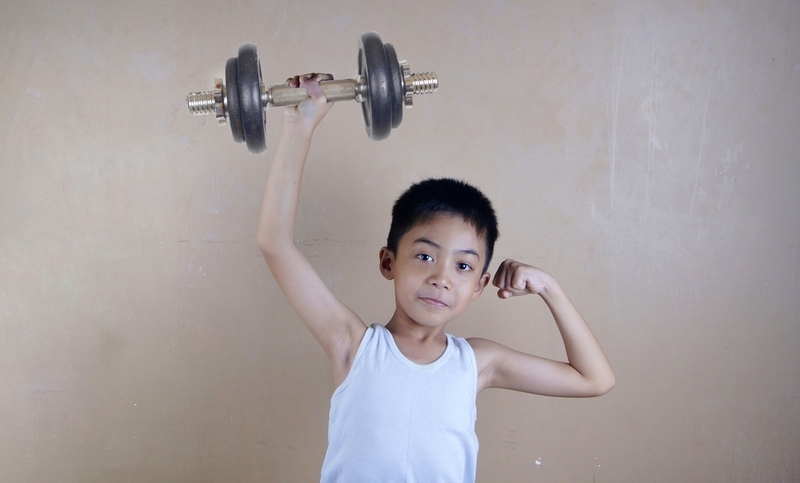 The medical community hasn’t always thought weightlifting is safe for kids. In the 80’s and 90’s, anecdotes of serious accidents and fears of growth plate injuries gave way to a consensus amongst doctors, parents, and coaches that the risks of weightlifting far outweighed the benefits. So what was their reasoning and how has it changed since? Well, their first concern should be familiar to anyone who’s a parent—accidents. Kids can be reckless, and in a room full of heavy dumbbells and complex machinery designed for adults, this recklessness can easily lead to injury. Of course, this problem is easily solved with proper supervision. But doctors had another concern, one a lot more complex and not so easily solvable: the vulnerability of a growing body, and the potential for injuries to the muscles, tendons, and growth plates. Remember, children are not miniature adults. Their bodies are in a state of constant flux, and when their bones grow, their muscles, fascia, and nervous system scramble to adapt, leaving the body weaker and less flexible than before; and with greater vulnerability comes greater risk of injury. As Dr. David F Gerrard noted in the British Journal of Sports Medicine in 1993, the “immature musculoskeletal system is less able to cope with repetitive biomechanical stress.” However, the biggest fear among doctors at the time was of injuring growth plates, the areas of cartilage at the end of long bones which contribute to the increase in limb length. An injury to the growth plate can lead to a premature fusion which stops the growth of the entire limb, causing limb length discrepancy, or a partial premature fusion, causing limb deformity (like a bow leg). The cartilage of the growth plate is more vulnerable to injury than the bone itself. This is why, when children suffer microtrauma or macrotrauma to an extremity, they often injure or fracture the growth plate and not the shaft of the bone itself. So what changed? Why are doctors, including the American Academy of Pediatrics, now giving the green light to pumping iron? Okay, so your 12-year-old, physically immature athlete can lift some light dumbbells, but probably shouldn’t be deadlifting 500 pounds. But what else do you need to know? What’s the safest, most effective way to strengthen your athlete? At the biological level, strength is increased by one of three ways: increasing the size of muscle fibers (hypertrophy), increasing the number of muscle fibers (hyperplasia), or increasing the number of motor units recruited. Physically immature children lack the requisite hormone levels for major gains from hypertrophy and hyperplasia, and thus are more reliant upon neurological adaptations for strength gains. It works like this. Let’s say, for simplicity’s sake, your player has 100 motor units in her muscle. When she normally performs an action, she uses only 50 of those 100. However, if she continually stimulates the muscle with resistance, the body adapts by recruiting more units over time (50, 55, 60, etc. ), thereby increasing strength. With so many definitions floating around, it’s hard to keep everything straight. And while it’s not necessary to memorize everything, it’s important to know the difference between strength training and weightlifting. Strength training is a means of improving strength through progressively increasing resistance. Weightlifting is simply a type of strength training, but it’s not the only one—TRX, elastic bands, and bodyweight exercises like squats and lunges are all forms of strength training too. It’s common sense. You have to crawl before you walk, and walk before you run. So why make your player do weighted squats when she can’t even do a proper bodyweight squat? Before you even think about a weightlifting program, you first need to make sure your player has a solid foundation: relaxed and balanced soft tissues, joints with a full range of motion, and the ability to perform all the standard bodyweight exercises (squats, lunges, etc.) with perfect form and without pain. It sounds easy enough, but you have to remember that the growing body is in a constant state of flux, struggling to adapt to its many changes. This is especially true during growth spurts, when children and adolescents are particularly vulnerable to injury. If your player is already unstable, adding weighted movements isn’t going to help—it’s going to hurt. So begin with the basics: bodyweight exercises with perfect form and proper movement patterns, and build up from there. It should go without saying, but training should be fun. And while some kids might find real joy in kettlebell swings and clean and jerks, I’ll bet they’re in the minority. Fortunately, as Dr. Faigenbaum says, “The body doesn’t know the difference between a weight machine, a medicine ball, an elastic band and your own body weight." So get creative—use medicine balls, resistance bands, and cones, and make it fun. Variety keeps it playful and helps prevent imbalances. Take control of your recovery—Download Dr. Erin B’s “Movement Cure” eBook today!